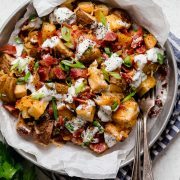 These potatoes are so divinely delicious and full of cheesy goodness that they could easily be counted as dinners main course and no longer the plain old side kick. 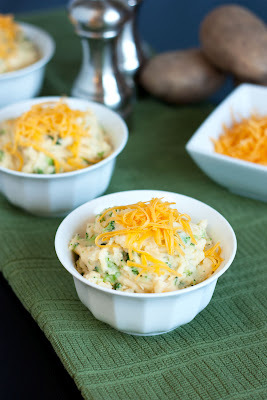 The best way to describe these potatoes: broccoli cheese soup meets mashed potatoes. Don’t get the wrong idea from that though, these potatoes aren’t soupy. 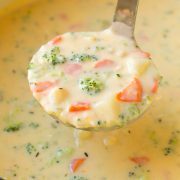 They are fluffy, flavorful and oh so cheesy, with all the right amount of nutrition from the broccoli =). They are mashed potatoes made luxurious. One thing I love about these potatoes is that you don’t need drippings from meat for gravy, just a whole lot of velvety cheese. 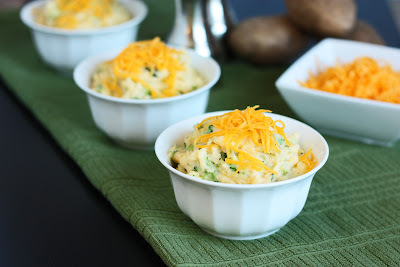 I hope you enjoy these irresistible Broccoli Cheese Mashed Potatoes as much as I do! If you like these you may also like to try my recipe for Twice Baked Potatoes. They are loaded with cheese, drizzled with zesty ranch, then finished off with crispy bacon and green onions, yum! 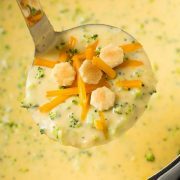 The flavors of broccoli cheese soup meet the deliciousness of comforting mashed potatoes for a side dish people will want on repeat! Peel and dice potatoes into about 2 inch pieces (I used medium potatoes and cut each into 6-8 pieces). Place diced potatoes in a large pot, cover with 6 cups cold water. Cover pot with lid and cook potatoes over medium high heat for 25 - 30 minutes until potatoes are very tender when pierced with a fork. Meanwhile, steam broccoli by placing broccoli in a microwave safe bowl with 3/4 cup water and microwaving on high power for 4 - 5 minutes until very tender (alternately you can steam the broccoli in a steamer basket placed in a saucepan with water over the stove top until tender). Drain water from broccoli and dice broccoli into tiny pieces, set aside. Warm milk, cream and butter in a saucepan over the stove top or in the microwave in a microwave safe bowl. Drain water from potatoes. Pour potatoes into a large mixing bowl. Mash potatoes very well with a potato masher. Add in warm milk mixture, sour cream, Cheddar Cheese, Parmesan Cheese, Romano Cheese, onion powder, garlic powder, salt and pepper then whip mixture with an electric mixer on medium speed about 1 - 2 minutes until fluffy and smooth. Fold in broccoli. Serve warm garnished with additional shredded Cheddar Cheese if desired. spiceblogger: OhMYGoodness! THis looks sooo good! I have a ton of fresh broccoli from our farmer’s market, and i think hubs would love this.